Author: Brigitte Nédellec. Series edited by: Gudrun Miehe, Brigitte Reineke, Manfred von Roncador. 16 pp. Roman, 361 pp. Naténi belongs to the Oti-Volta branch of the Gur languages and therefore is a part of the large Niger-Congo language family. It is spoken by approx. 30,000 people. Naténi is – as a Central Oti-Volta language – surrounded by East Oti-Volta languages, Byali in the North, Nyendé in the West, Ditammari in the South, and Waama in the East. Naténi itself is divided into four dialects: Naténi (proper), Tayari, Kunteni, and Okoni. The dialect Naténi examined in this book is spoken in the Atakora province in North Bénin. The speakers are called Natemba. The present work is aimed at describing and analysing the strategies of Naténi expressing the concept of semantic modification. Initially, the author shows that Naténi lacks the word class adjective to express categories of qualification. Consequently, nominal, verbal, and metaphoric-syntagmatic strategies are consulted to realise the seven adjectival functions or classes Dixon worked out with semantic, syntactic, and morphological criteria. After a description of the phonology, morphology, and syntax of Naténi, the noun word class is extensively examined and analysed in consideration of its “adjectival” functions. Subsequent, constructions containing the thematical role of an “experiencer” which are used in Naténi to express semantic modification are researched. The work is completed by three appendices containing original Naténi texts. What is this book? 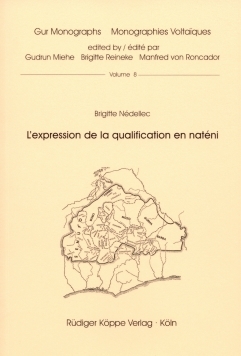 – It is a 350-plus-page book in French on what the author calls “la qualification” and I call “descriptives” [...] in Naténi, an Eastern-Oti/Volta Gur language of northern Benin. What can one say about such a thing in 1000 words? I hope I have passed the insecurity of needing to pick nits to show that I have actually read the book and summarise the arguments to show that I have understood it. I have always tried to avoid the sort of review which says that I would have written a different book and proceeds to give the outline or main points of the book I would have written. You want to know is this book worth reading, quoting in your writing, or acquiring for your library. If you read French and have some knowledge of and interest in (E-O/V) Gur languages and/or descriptives, the answer is certainly “Yes”. I do and have, but don’t know how many others there are out there. [...] The Gur Monographs editors and Rüdiger Köppe Verlag have done a good job of production and with the author have ensured that very few typographical or type setting errors have remained uncorrected. An entertaining read? – No. Worth reading? – Yes. Get it for your library.